This guy (and his Nexus 7)! Author ssweenyPosted on October 26, 2012 June 19, 2014 Categories Computer Geekery, UbuntuTags Nexus 7, Ubuntu, UDS1 Comment on Who’s Ready for Copenhagen? In the evening was the much-beloved after party which had a super hero theme this time around. I spotted The Hulk stomping around the room and our CEO gave her “thanks for all the hard work” speech dressed as Supergirl. The party itself was loads of fun, with the Ubuntu All-Stars playing some classic tunes (can’t go wrong with “Wish You Were Here”) and lots of alcohol-inspired dancing. After an exhausting week it was time for one more sleep then the a short plane ride home. After lunch was a plenary with a few interesting talks. The first was about how OpenStack integrates with Launchpad and how they use continuous integration. The second was an introduction to the Ubuntu Friendly project, and the third was about how UEFI Secure Boot affects Ubuntu. Next session was a tech preview for the Wayland compositor, which will supposedly replace the X server sometime in the future. The “preview” consisted of a hilariously short, very crashy demo of the software, which is to be expected in a “tech preview” since the “tech” doesn’t quite exist yet. I think that Wayland will be very useful in some cases, as in portable or other low-power devices where X is overkill, but I’m not sure that it will end up replacing X across the board. Due to some scheduling errors, the last session of the day that I wanted to attend was on power management from a whole-system perspective. The session had actually happened earlier in the week but was left on the schedule for reasons unknown. Since I had some time to kill I helped new recruit Matt debug a video driver problem. In the evening a few of us caught a shuttle to Pointe Orlando for dinner. We settled on Maggiano’s where we ate family style. Four courses involving chicken, pork, and salmon with crème brûlée and tiramisu for dessert. Quite tasty. After dinner it was back to the hotel and a (relatively) early night. Next was a lecture by Vincent Guittot of Linaro about potential power savings to be found when the multicore/cluster scheduler is tuned to be aware of power consumption as well as performance concerns. Unfortunately the presenter was supposed to dial in but the conference phone wasn’t working. He dialed in to someone’s cell on speaker but it was so hard to hear that the presentation itself was nearly worthless. The good news is that they put up slides[odp] and a wiki page with the relevant information. After lunch was a plenary session with two presentations. First a representative from ARM went over the current ecosystem around their platform and the upcoming changes in ARMv8. Then we had a speaker from OIN talk about defensive patents and the current state of software patents in general. Finally they took everybody outside (under the Daystar!) to take a group photo. Considering how tightly the 700 or so of us were packed I thought the jump shot was a bit on the dangerous side. Next I attended a workshop on Qt Quick. It was a nice demonstration on the kinds of interfaces you can design using Qt Quick’s declarative QML language. They were very careful to emphasize a separation between logic (C++ or python) and presentation (QML). In the evening we had a small gathering for our group with drinks and hors d’oeuvre. Not being satisfied with that a bunch of us walked about a mile along the side of a highway to get to an Irish pub in a nearby strip mall. We ate, drank, and made merry then headed back to the hotel (some folks wimped out and took a cab) for more of the same. After that I was supposed to go to a session on improving the collaboration between Ubuntu and Linaro, but that seemed a lost cause as nobody from Ubuntu showed up (I don’t count since I don’t work on the distro). The meeting was postponed until they could convince someone to come. In the meantime I had a nice hallway discussion with Alex and Michael about personal backup solutions. After lunch was a set of short talks. First up was a couple of guys from OpenStack talking about automated testing of code before allowing that code to be merged into their main tree. For functional and integration testing they have a slick tool which automatically sets up an Ubuntu machine with the software needed to run OpenStack and fires it up with the code to be tested. Next was another OpenStack talk about DevStack, which is a script which allows you to quickly set up an OpenStack development environment. Following that talk was the Steve George, the VP of Business Development for Canonical, talking about the need to bring consumer applications into Ubuntu if we want to reach a critical mass of users. The talk largely centered on developer.ubuntu.com and similar efforts to make it easy and attractive for developers to get their software into Ubuntu. The final talk of the series was by a gentleman from Nokia discussing the Qt ecosystem. He mentioned that Qt is run by the Qt Project rather than Nokia itself, and that it’s already being used in many products including home media devices (I found out later that the PS3 Netflix application is written in Qt). He also talked about the features we can expect in Qt 5.0, due out in 2012. My last session of the day was a demo put on by the Qt guys showing off some of their work in the embedded space. They demoed Qt Quick on Ubuntu core running on both a PandaBoard and a Tegra 2 board. They also had a hilarious interactive demo of a working calculator which spins in 3D and turns into a scene with a wheeled robot cruising around. In the evening we had a happy hour with plenty of beer but a dearth of food, so a bunch of guys from my group ordered pizza and downed it in the hotel lobby (near the bar of course). I got to meet two new recruits to the group, both of whom started this week. I was happy to discover both that I am not the only person that got thrown into UDS on their first day of work, and that I am no longer the “new guy”. Sunday evening I arrived in Orlando after a short flight, which was only stressful because I had no word about the ongoing Steelers/Patriots game until we landed. I was happy to hear that it ended the right way, and could relax and focus on the business at hand. The shuttle to the hotel was full of Linaro guys, and we had a nice talk about ARM development boards during the ride. It was a short one, and we arrived at one of the biggest hotels I’ve ever seen. It’s not really one hotel as much as it is a complex, with several towers full of rooms and a convention center surrounding an outdoor pool/lounge area (here’s a picture). After checking in I took a walk around the grounds trying to get a feel for the place and have some idea of where the important areas (conference rooms, bars) are. I stopped by the hotel bar and chatted with some other UDS folks. I met Thomas Bushnell of Google, who works on their internal Ubuntu desktop OS (chatted with him about Android) and a nice chap from ARM whose name escapes me (chatted with him about… ARM). Eventually I met up with some folks from my group and others who I knew from the UDS in Budapest and we got caught up before calling it a night. Today was an exciting, action-packed adventure full of sitting in rooms and listening to people talk. Actually I attended some very interesting sessions and got to make my own humble contributions to the discussions. First up was Mark Shuttleworth’s keynote, where he discussed the what’s coming up for Ubuntu. 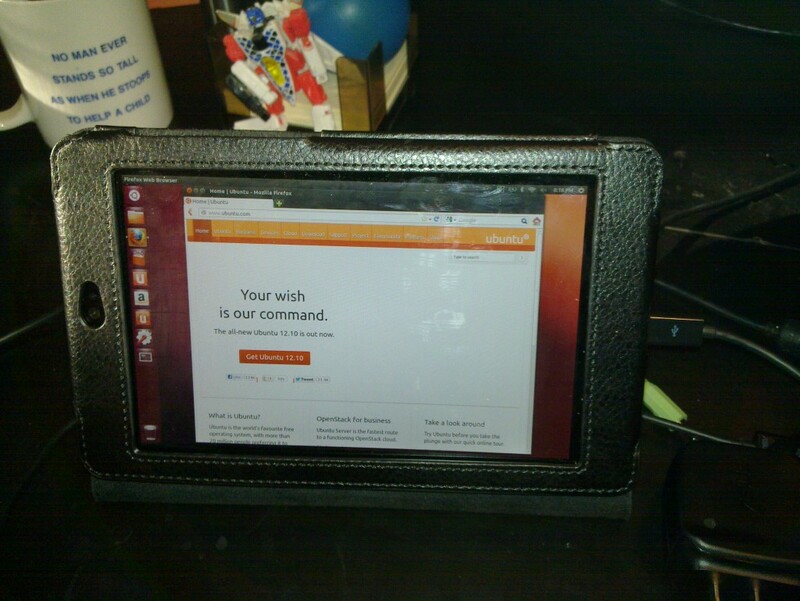 There are some really exciting things in the pipeline, including bringing Ubuntu to phones, TVs, and IVI devices. The next couple of years are going to be full of new gadgets for me to buy… you know, for “work”. After lunch was a plenary session with a couple of talks from Cloud Foundry about deploying web apps in the cloud. Also there was a short talk from the Debian Project Leader about the history and current state of the relationship between Ubuntu and Debian. In short, it’s better than it was, but there are still areas ripe for improvement. In the evening was a meet and greet event complete with free food and drinks. I ended up talking to Karen Sandler, the newly-minted executive director of the GNOME Foundation, and a couple of the developers behind the Shotwell photo manager about baseball and real-life story behind Moneyball. Later I met up with my team members again and my newly-minted boss (Hi, Alex!) bought a round of drinks for everyone. After a bit of socializing I decided I’d had enough fun for one night and packed it in. Plenty more action to come this week. Up early, caught the shuttle to the airport. Long wait at the check-in desk. Looks like the self-check-in machines were broken, but in such a way that each person got to try to check-in twice before being sent to the desk to have it done manually. Got myself checked in and made my way to the gate. Lots of other UDS folks also heading to Frankfurt. Talked to a few of them. Sat next to one of the other OEM team members on the plane. This time the connection through Frankfurt airport went smoothly. I did have to head out and find the US Airways check-in desk to grab my remaining boarding passes but I had plenty of time and made it to my gate without incident. On the plane back to the States I sat next to one of the gentlemen from Monday’s Frankfurt Airport Support Group. We caught up a bit and soon after we took off he was fast asleep. Finally caught the end of Green Hornet. The movie itself was OK but it seems like Seth Rogen’s style of comedy didn’t really fit the character or tone of the movie. It just felt off. Also watched a documentary on rice that led to a nice 40-minute nap and another on personal flying vehicles that I actually found fascinating. Also watched the Tom Cruise/Cameron Diaz vehicle Knight and Day which was surprisingly entertaining. Arrived in Philadelphia and waited an hour in line to go through immigration, then through customs and another half an hour to get back through security for my flight to Pittsburgh. Once again no hiccups but I was in no mood to stand in line all evening. Landed in Pittsburgh just ahead of a thunderstorm. Unfortunately they can’t unload baggage from an airplane during a lightning storm so about three planefuls of people had to sit at baggage claim for an hour and a half before we could collect our things and head home. Emily showed no end of patience and even had a granola bar and a bottle of pop waiting for me in the car when she picked me up. Have I mentioned that I am a very lucky man? We drove home through some heavy rain. Unpacked and passed right the hell out. Up rather late, had to skip breakfast. Probably for the best. After lunch there was a group of “lightning talks”, quick 5-10 minute presentations on cool things going on with the project. Lots of improvements to Launchpad and byobu. Thanks to a lack of interesting sessions after that I had a chance to walk around Budapest for a while. I ducked into a couple of shops and generally tried to take in as much as I could before returning for the wrap-up talk. At the wrap-up Jono announced that the next UDS will be in Orlando. I haven’t been there since I was a kid so I’m looking forward to seeing it with a different perspective. At 7 the UDS party got into full swing. There was free food and drink, music and merriment. The Ubuntu Allstars is a group that gets together for every UDS and puts together a loose set over the course of the week to be played at th e after party. The music ranged from ballads to blues to classic rock and 80s pop. Matt Zimmerman sang a rousing rendition of George Michael’s Faith. Around 10 I’d decided I’d had enough fun and called it a night. I was exhausted from this marathon week and had to catch a shuttle at 7AM to the airport. Sleep came easily. Up early, down to breakfast. After lunch everyone got together for a group photo (if you zoom in you can see me towards the front on the left). The OEM team had its team dinner, which started as a cocktail hour, then moved to a nearby restaurant for pizza (again!) and beer, then to another place for even more beer. I got to know my new teammates a bit, and got to chat with the likes of Jono Bacon, Stuart Langridge, and Ken VanDine. Eventually I made it back to my room and promptly passed out.